One Balfour Beatty worker told libcom.org that the union had called off the picket at 8am and that workers going on site after that time would not be breaking the strike. The worker also told us that it seemed like workers were "going down the appeals route." Site sources explained however that problems with pay rates had been bubbling since the summer and Balfour’s refusal to engage properly with requests for a completion bonus as work begins to wind down has left “feelings running pretty high.” Meanwhile, another Balfour Beatty worker told libcom.org that there were rumours the company planned to replace the sacked staff with agency workers starting from January. 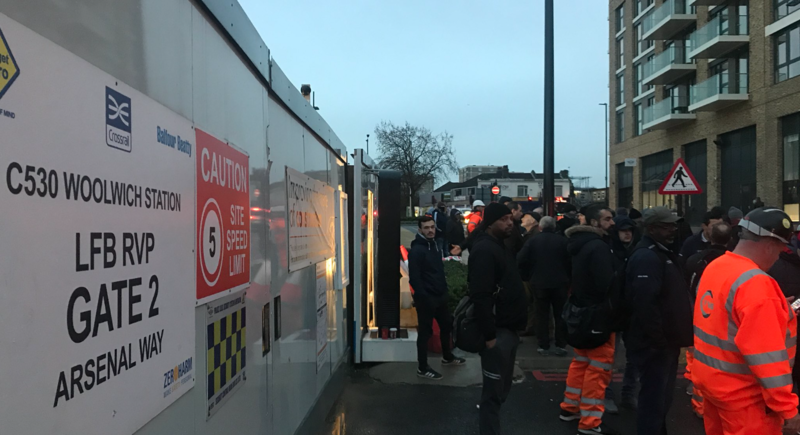 A mass picket was held at 6.30am this morning at the Whitechapel station site. Re-posted from Freedom News, with additional reporting from libcom.org.